The main shopping thoroughfare in modern Naples is via Roma, a name that many Neapolitans reject in favor of the original name, via Toledo, named for Don Pedro di Toledo, the Spanish viceroy of Naples from 1532 to 1553. He was one of the most notable in a long line of representatives of the Spanish throne who ruled Naples between 1500 and 1700. Don Pedro is the viceroy who began the great Spanish reshaping of Naples, changes that extended into every aspect of life in the city, from the building of new living quarters to the enlarging of port facilities and shoring up of city fortifications. The Spanish renovation of Naples was precisely that—a renewal, one that cast Medieval and Renaissance Naples in a modern sixteenth-century mold, which would then carry the city directly into the age of the Baroque. Via Toledo, begun in the late 1530s, was the centerpiece of one of the most impressive projects undertaken by Don Pedro: the construction of an entirely new popular quarter of the city, today called, simply, The Spanish Quarters—or, by many Neapolitans, the Casbah(! ), thus recalling the Moorish influence in the history of the builders. The main street, via Toledo (bounding the Spanish Quarters at the bottom of the above map) was laid out to lead north from what is now the square in front of the Royal Palace. In the 1530s there was not yet a Royal Palace, but the square itself was adjacent to the large complex that included the Maschio Angioino and the living quarters of the Viceroy; thus, it was a logical place to start a new main road. Via Toledo ran along the line of an earlier city wall and was actually intended to supplant that fortification, literally breaking the confines of the medieval city and extending it up the slope of the hill of San Martino, a natural barrier. Via Toledo then continued on to Largo Mercatello, later, under the Bourbons, to be known as Foro Carolina, and today as Piazza Dante. The Spanish Quarters (generally plural, although it is now thought of as a single area) thus start at the beginning of via Toledo and consist of dozens of symmetrical square blocks, with the east-west streets running up the slope of San Martino. There are about a dozen of these streets between the Palace and the section of Naples called Montesanto. They lead up the slope from via Toledo and are then crossed by a number of secondary parallel streets, each one at a progressively higher level on the slope. The effect is of a chessboard of perfect little squares built on the side of a hill. A great number of stairways are built into the east-west streets to help pedestrians hike up and down the slope. The Spanish built a number of villas and residences on the spacious sites fronting the new via Toledo. Many of these buildings are still standing and recognizable even through centuries of overlaid architecture. The Spanish expansion also included the area on the other side of via Toledo and running north towards Piazza Dante. Thus, one finds the Church of San Giacomo degli Spagnoli on the east side of via Toledo on what is now Piazza Municipio. 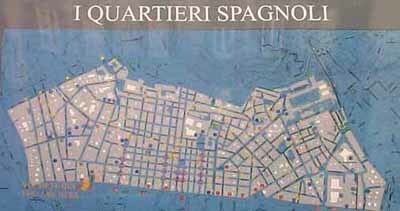 The entire area of the Spanish Quarters in the first few years of its existence housed many of the 6,000 Spanish soldiers quartered in Naples in the mid-sixteenth century; the troops then found accommodations in a central barracks in the 1650s. The area behind the main street still contains some Baroque churches from the late 1500s and early 1600s. The most famous of these is the Church of Santa Maria della Concezione a Montecalvario, from the year 1589. This church was also the site of an orphanage sponsored by the congregation and which was in operation until the end of the 1800s. The church was rebuilt in the 1720s and has a central space with side chapels and a dome. The residences in the Spanish Quarters are four and five stories high, quite an accomplishment for 1600. (Even as late as the 1870s, Mark Twain commented on the “tall buildings of Naples”.) The blocks were an enormous departure from the winding clutter of medieval cities and are, perhaps, the first example of modern urban planning in Europe. "Urban planning" should, realistically, not be understood here in the benevolent twentieth-century sense of providing the poor with a decent place to live, however. [For a separate item on urban planning in Naples at the beginning of the 20th century, click here.] An age of absolute monarchy was concerned less with such things than it was with its own physical security. Here, one does well to recall Lewis Mumford’s remark that the clearing away of the small winding medieval streets of Paris by Napoleon III in the mid-nineteenth century did away with the last physical barrier which protected the common citizen from the power of the absolute state. Such was the case in Naples: a long rebellious nest of medieval clutter into which the King’s soldiers ventured at considerable risk was made more manageable by the introduction of broad straight roads that were easy to patrol. The centuries have by-passed that concept somewhat, for it is now the streets of the Spanish Quarters, themselves, that have acquired a foreboding reputation as a section of Naples where a stranger does not enter without some concern. Another item on Spanish buildings in Naples.